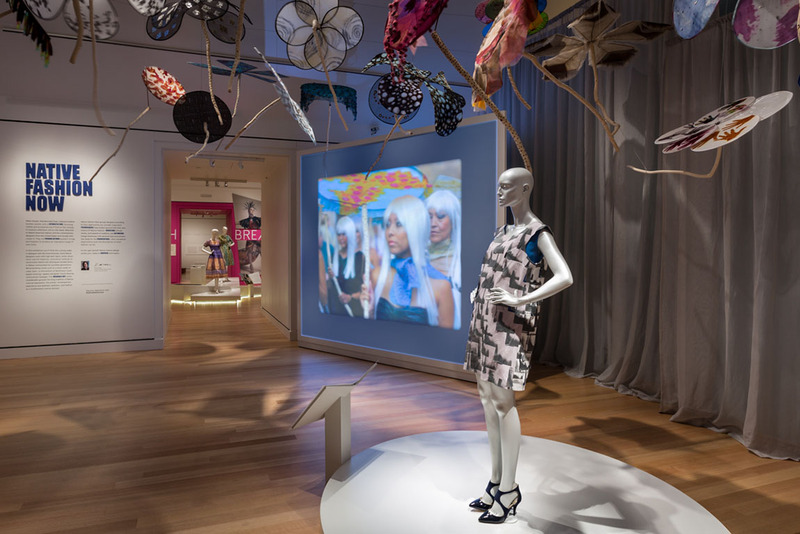 The Native Fashion Now Inspiration Board is an interactive visitor experience that invites participants to step inside the minds of a selection of the designers in the exhibition. Audiences have the feeling of being “accompanied” in their explorations by artists in the exhibition, whose presences on video and audio surround them in the space, providing them with insights about the intellectual, emotional, and physical processes of envisioning and creating original garments and accessories. Artist Pat Pruitt describing the energy required to create his art work. Artist Orlando Dugi describing preparation for runway shows. Artist Jamie Okuma describing the materials she uses in creating her work. 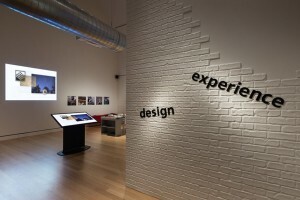 Native Fashion Now exhibition intro experience. From vibrant street clothing to exquisite haute couture, this exhibition celebrates the visual range, creative expression and political nuance of Native American fashion. Nearly 100 works spanning the last 50 years explore the vitality of Native fashion designers and artists from pioneering Native style-makers to today’s maverick designers making their mark in today’s world of fashion. From one of Patricia Michaels’ (Taos Pueblo) recent finale ensembles from the reality television series Project Runway to Jamie Okuma’s (Luiseño/Shoshone-Bannock) dramatically beaded Christian Louboutin boots and innovative works made from mylar, vinyl and stainless steel,Native Fashion Now underscores Native concepts of dress and beauty, which are inextricably bound to identity and tradition in a rapidly changing world. 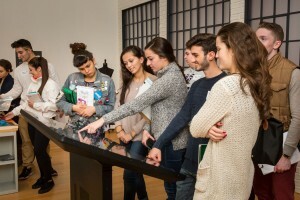 Upon first entering the gallery visitors encounter a large-scale video projection on the wall and notice that the source of the projection is a large touch-screen table, resembling a drafting table. Following a short prompt on the screen saver, visitors can touch the images, discovering that they can easily move around, flip over, enlarge and shrink, or otherwise activate them. 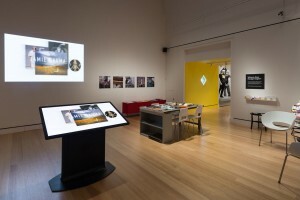 Each image, selected by the designers themselves, represents a personal source of inspiration or element of process: style icons, favorite materials and techniques, aspirations, visual references, and emblems of personal identity. Some function as audio and video files that can play a short clip of artist interview material or favorite songs to listen to while working. As users move the images around, they reveal captions and quotations from artists (and others cited by the artists). Ultimately, as users progress through the experience, they reveal the artist’s name and one of their works that can be seen in the gallery. – Contemporary Native American fashion goes far beyond buckskin and fringe, expanding on time-honored materials, motifs, and techniques while imaginatively integrating them into the multifaceted, up-to-the-minute, and vibrant world of fashion. – The artists in the show, as individuals, draw on wide sources of inspiration to create clothing which expresses empowerment, connects to personal and cultural identity, and drives change. The Inspiration Board content is drawn from the featured artists themselves. Each artist participated in an online interview process during which they offered detailed responses about their materials, work processes, inspirations, and personal tastes. This material is made available using image and captioning, which is also augmented by video compiled during in-person artist interviews. Short audio clips, such as the music artists listen to in the studio, are included as well. The interactive was built on a 4K resolution 55in Ideum multi-touch table. We wanted to deliver very high resolution images and video, giving visitors access to minute details that could be blown up on the gallery wall to create a large immersive experience that many visitors could enjoy simultaneously. The work was originally designed for the PEM installation, but will be traveling with the exhibition to the Portland Art Museum, the National Museum of the American Indian, and the Philbrook Museum.